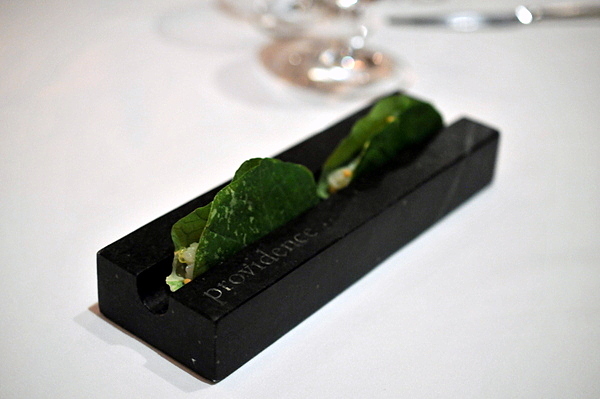 Providence was among my earliest fine dining experiences but since then most of my visits have been for special events like the 5x5, Bocuse d'Or, or Four for Fish dinners. The last time I'd had a proper meal from Cimarusti was over three years ago so with white truffles and Japanese Wagyu now seemed like as good a time as any for a return visit. A fun modernist play on the welcoming cocktail, this has all the floral tang and stiff booziness of the classic Greyhound. 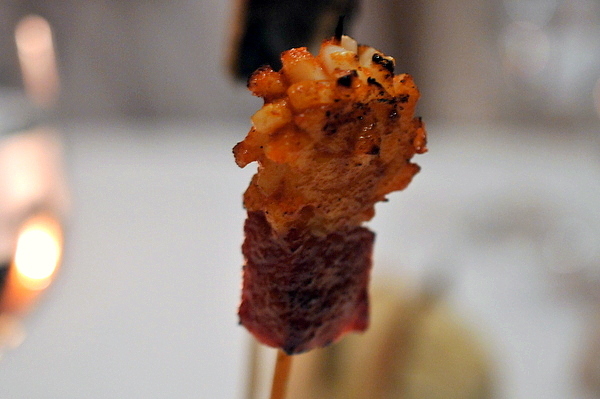 This was the most elaborate of the opening canapes. Stuffed within the crisp vegetal leaves was a filling of toasty puffed rice and finely chopped scallops seasoned with a gentle citrus marinade. The classic ritzy savor of the cheese puff was amplified by the layer of melted cheese on top. The pumpkin soup didn't really work for me but my companion loved the holiday-spice tinged sweetness of the thick silky potage. 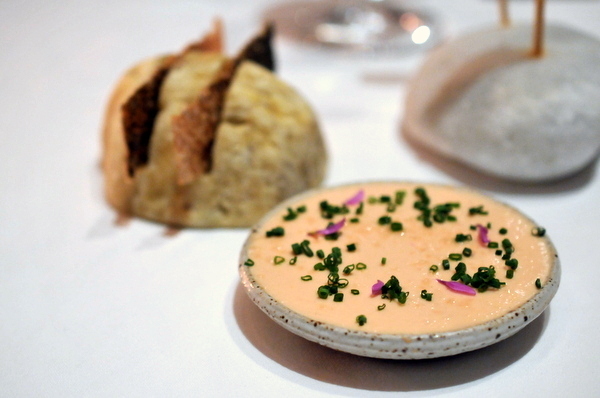 The skin has a brazen salty potency to it while the smoked trout adds an intense fishiness; a complete turnaround from the profound sweetness of the pumpkin soup. 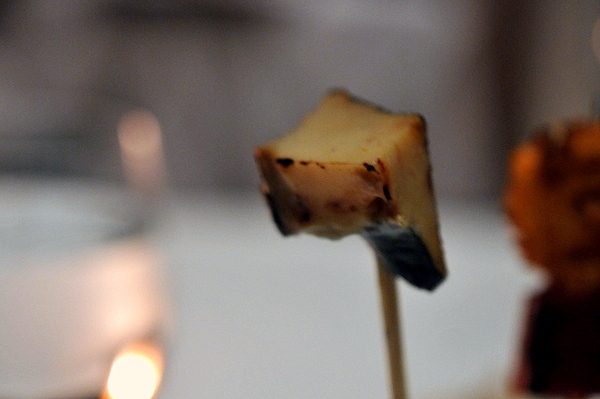 The grilled abalone wins points for its purity of flavor. The surprisingly tender muscle is imbued with a wonderful char and light spicy tingle as well as a lingering briny finish. 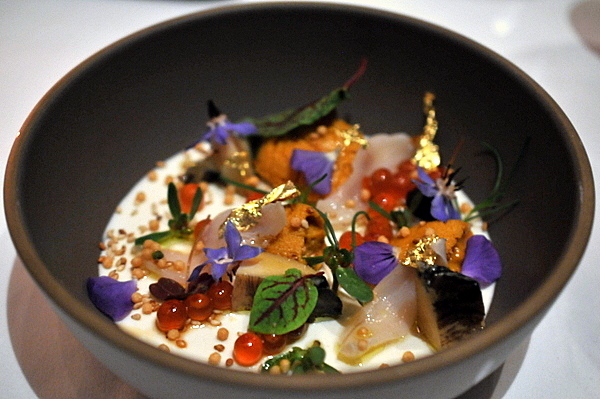 Like the abalone, the squid has a smoky char and dense yet tender texture. The slab of sausage provides a piquant savor to accompany the delicate salinity of the squid. The meal proper began with thick luxuriously oily slabs of kampachi sashimi. 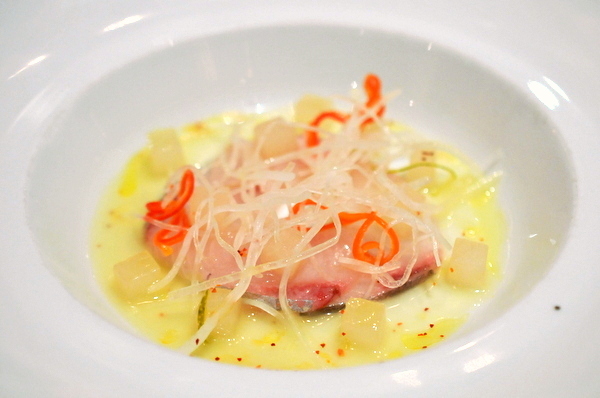 The fish is deftly tempered by the combination of tangy apple juice and the astringent crunch of daikon. An ephemeral touch of spice hovers at the edge of the palate providing a subtle touch of heat but defying attempts to bring the pepper into focus. 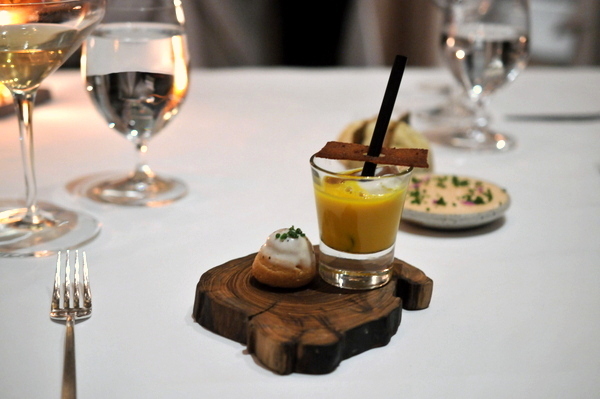 This is a variation on one of my favorite courses from 2011 with crème fraîche in place of the soymilk panna cotta. The swimmingly fresh troika of shellfish deserves to be the star but in stead of a complex bouquet of brine, the palate is saddled with the weighty tang of the fatty cream instead. Good sea scallops need almost no adornment and these were among the most flavorful that I'd ever tasted. 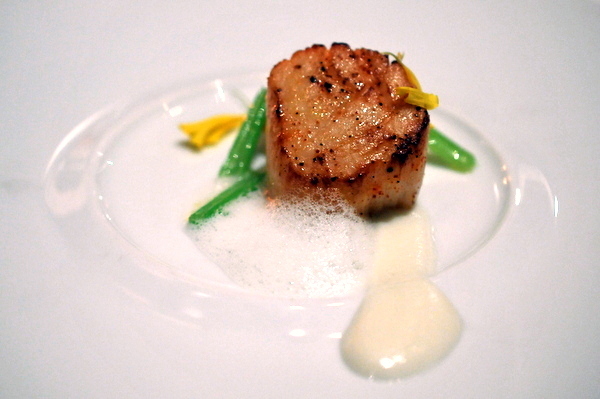 The turnips provide an almost diametrically opposed flavor and texture, bitter where the scallop is sweet and succulent where the scallop is dense, the contrast gives the dish a captivating sense of finesse. 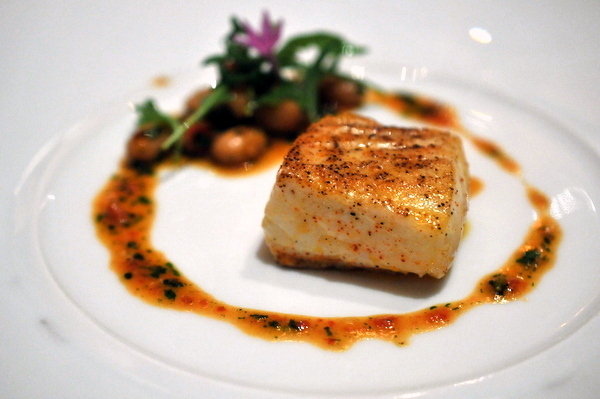 This was simply one of the best cooked pieces of halibut that I've tasted in some time. The fish breaks apart easily with a juicy sheen coating while the sage gives the halibut an understated zest. Meanwhile the beans provide a welcome starchiness while the tomatoes add a racy acidity. The result is a complete meal on a plate that conveys a simple yet satisfying heartiness. My favorite thing about winter: truffle season. 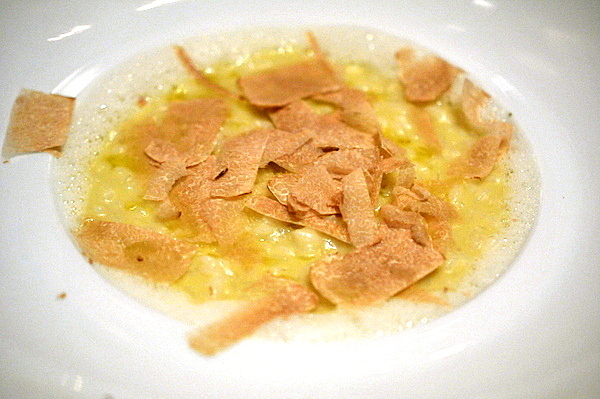 Providence offers a number simple truffle/starch combinations and we opted to add a risotto to our menu. The rice is on the rare side of al dente with occasional bits of grit but still serves as a beautiful platform for the elegant perfume of shaved white truffle. 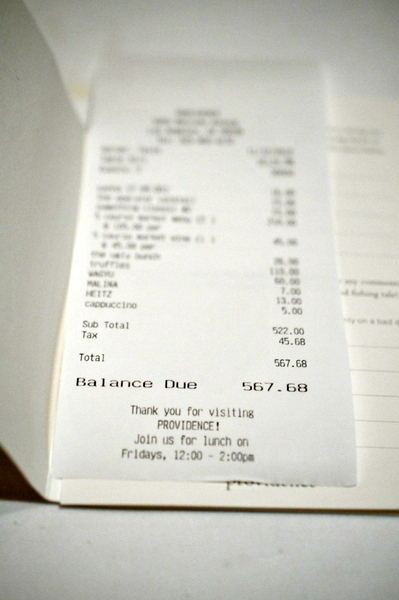 A tasty risotto to be sure though perhaps not quite worth the $110 tariff. 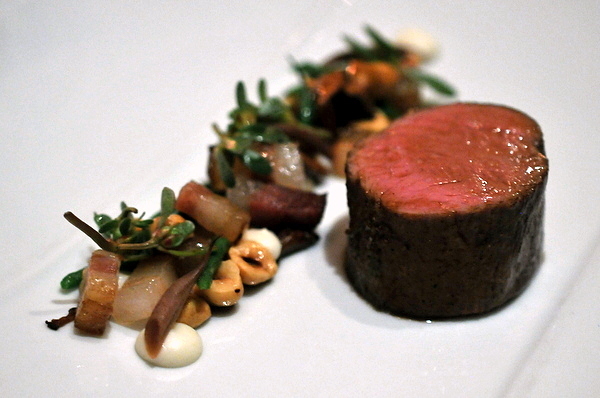 This was a quintessential representation of veal. The meat is meltingly tender with a lean with a clean savor. The chanterelles add an earthy musk that expands upon the meat's clean savor while the beans and nuts add a sense of crunchy levity. The bacon was the real kicker here, with an intense smoky flavor and fatty snap the bacon is striking where the veal is reserved. After a three year absence, true Japanese Wagyu beef is again available in the States and I wasn't about to pass on my first opportunity to try it. The Wagyu couldn't have been more different from the veal; though just as tender the meat has thick veins of marbling and a resounding oiliness. The meat was sublime on its own but the bacon provided a discordant fattiness that clashed with flavor of the beef. 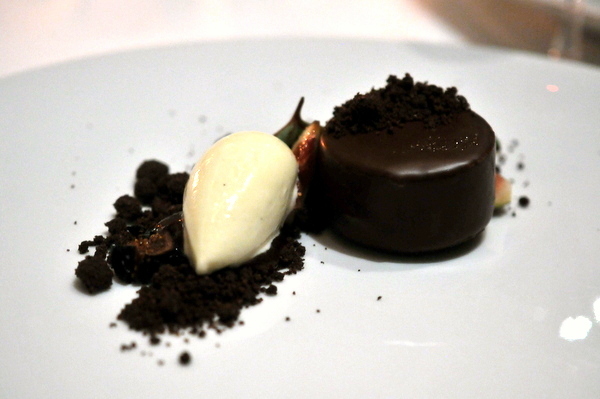 With so much potent dark chocolate I was surprised that both the ice cream and figs stood out so prominently. The former gave the chocolate a lovely winter spice while the latter is apparent in a jammy ripeness on the finish. 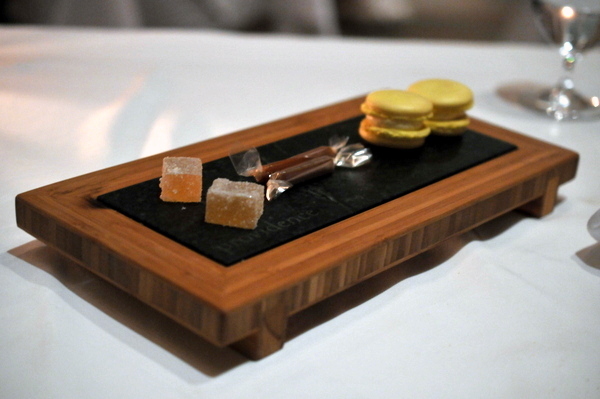 With Adrian Vasquez's departure Providence no longer offers their chocolate lollipops but the macarons, caramels, and pate de fruit were all quite enjoyable. 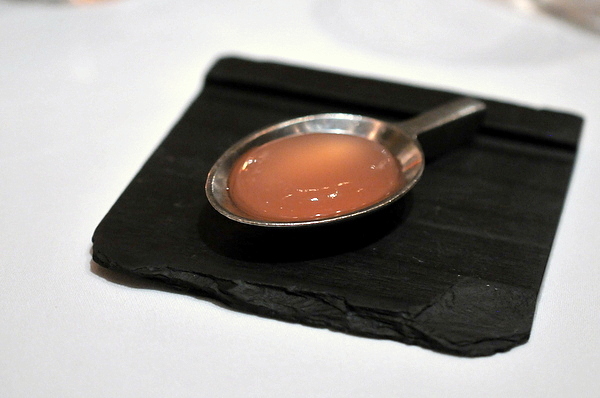 My favorite was the caramel, which offered an enigmatic mix of miso and black pepper to temper the overt sweetness of the candies. My previous trips to Providence were enjoyable but left me wanting. Though I has some complaints about the a la carte supplements, the tasting menu demonstrated creativity, finesse and flawless execution. This was the meal I always knew Providence was capable of delivering which left me wishing I'd gone with the Chef's Tasting instead. I figured they'd do something different in terms of the accompaniments for the wagyu and veal. 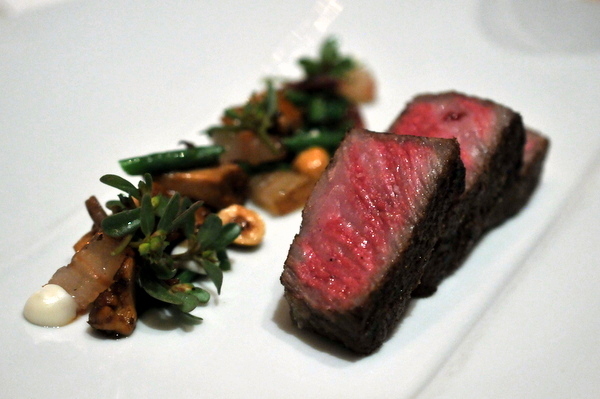 Where else in LA is serving A5 wagyu now? I thought I read something about BLT, and I figure CUT would have it. They do normally serve the wagyu with potatoes and tomatoes, but I just had it inserted in place of the veal for one of our two tasting menus. I do know cut has it for sure but that meal isn't till next weekend.